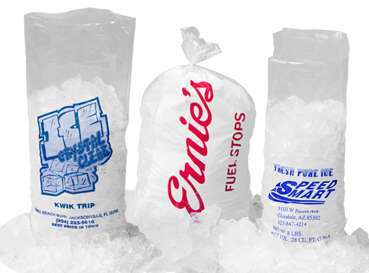 Packaged ice is the most profitable category in a convenience store. If you are still buying ice from the wholesale ice companies you're paying too much. 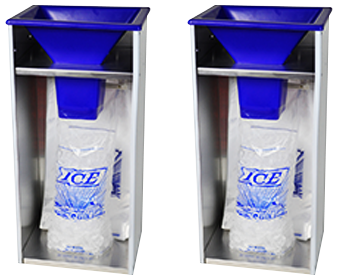 Ice Bagging Machines can help dramatically reduce procurement cost for ice intended for resale for convinience stores, grocers, retailers, and other businesses. 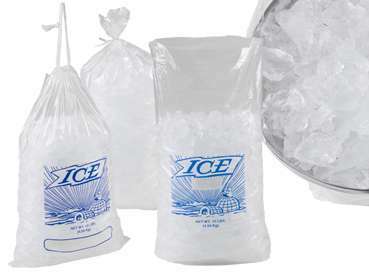 Time Savings - Fill a bag of ice less than 10 seconds. No Mess - No more wasteful spilling this unique funneling system deposits ice directly into the bag. Wholesale Prices for your Custom Ice Bags mean BIGGER SAVINGS! Buy in bulk and we will store them free for 6 months. 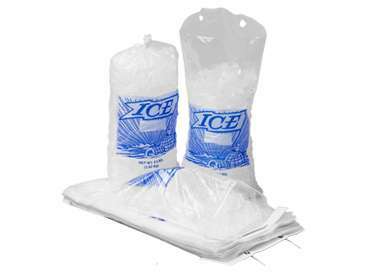 Ice Bags are available as a stock item, with our "Pre-printed Ice" print or with your custom art. We can also use our stock art and slug in your store's information underneath.We produce high quality ice bags. Made In The USA, from extruding film to printing and converting. We have a large selection of film colors to choose from and you can print up to six colors. 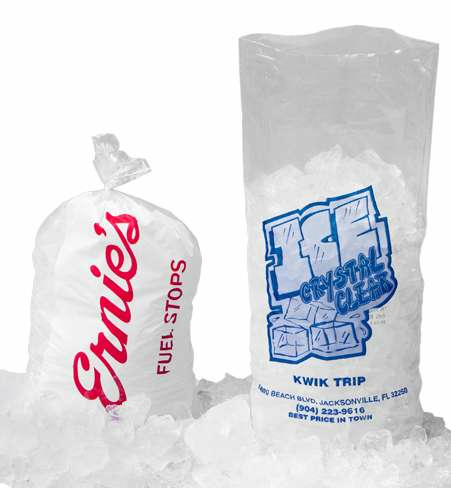 We can imprint your business name, logo or design in up to 6 colors on ice bags. It's the most cost effective advertising you can do. Ice bags resist temperatures to 20 degrees below. "EVA" additive increases strength and puncture resistance. They are made of tough, yet pliable, light weight polyethylene. Pre-Printed Metalocene Specialty formulated ice bags stand up to rough handling and cold temperatures. They meet FDA and USDA specifications and resist temperatures to 20 degrees below. "EVA" additive increases strength and puncture resistance. Making Custom Printing Easy! Manufactured to your specifications. We can imprint your business name, logo or design in up to 6 colors on any type of poly bag or film. It's the most cost effective advertising you can do. You can choose from hundreds of sizes of poly bags. If we don't stock the size you need, we will have it custom made for you.